Getting "Error: Sorry, something went wrong. The following file(s) has been blocked by the administrator." in SharePoint 2013? 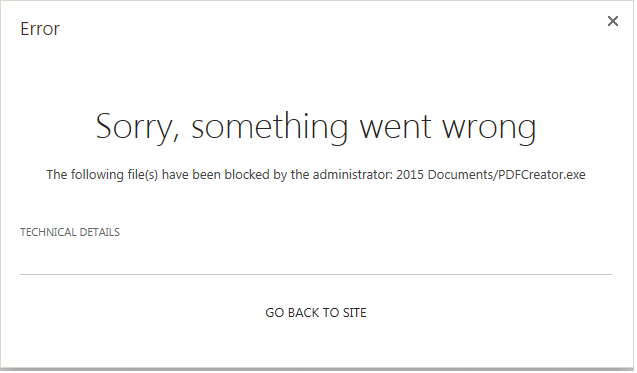 Well, This is due to Blocked File Types configuration in SharePoint 2013! Blocked file types is a security mechanism in SharePoint to restrict files based on its extension. Obviously, You want to protect your environment from potential threats via Malicious scripts and executable. Or as part of your governance policies, You don't want your users to upload MP3 files to SharePoint, isn't it? So, blocked file types restrict specific file types from uploading to SharePoint. 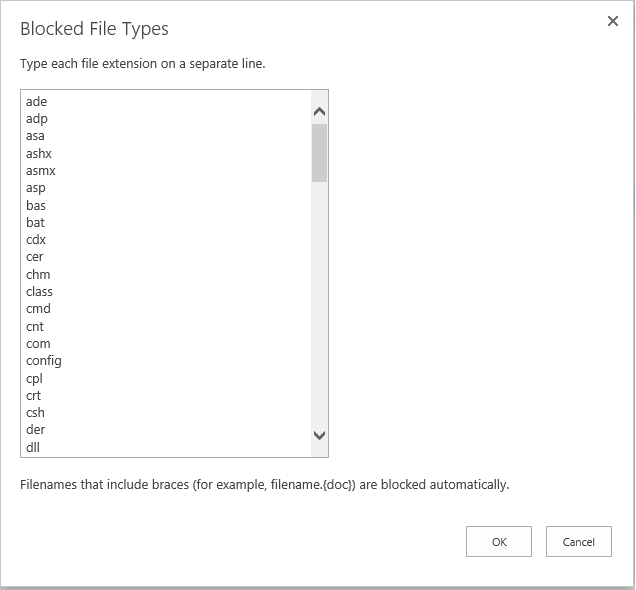 Users cannot upload these blocked file types to SharePoint list (as a attachment!) or a library. Please note, SharePoint checks for blocked files ONLY based on file's extension but not actual file type. In other words, You can rename a blocked file (say: EXE file to Doc) to something else to allow SharePoint to upload the file. 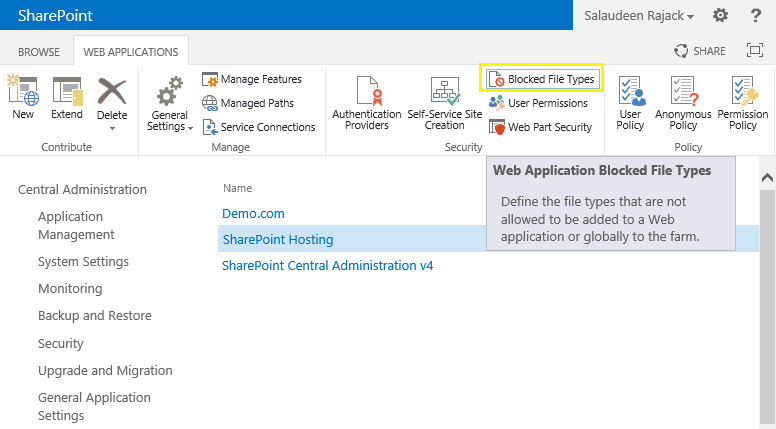 Tips: In short, Blocked File types defines File types that are not allowed in SharePoint! 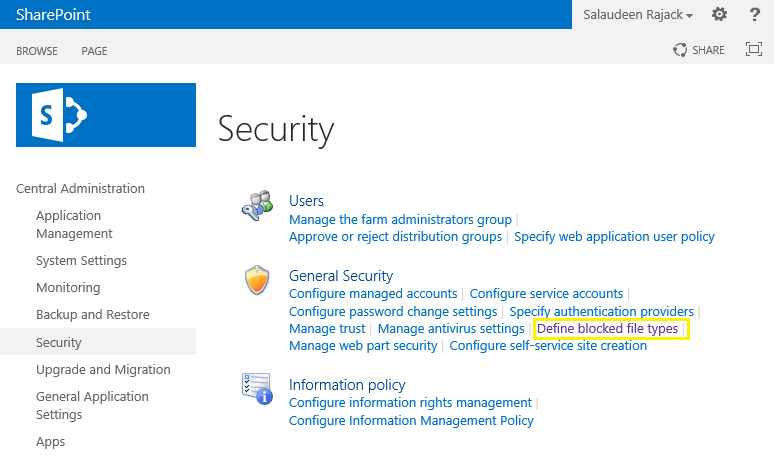 Blocked files management is done from SharePoint 2013 Central Administration site. To manage blocked files, Navigate to Central Administration >> Security >> Define Blocked File Types. Blocked files list is configured per web application basis. You can get the list via "Manage Web Applications" page as well. By default, There are 105 blocked file types in SharePoint 2013. To allow or restrict file types, you can edit this list. Just enter one Extension per line. To remove restriction on a particular file type, Locate and remove that extension from this list. Here is an example in PowerShell script to get/add/remove blocked file types in SharePoint 2013. How about Files which are already uploaded? Blocked file type settings are applicable not only to new files which you are going to upload but also to existing files. So, if a blocked file type is already uploaded, you can't edit or view the file. Only delete operation is permitted. How to restrict a specific file type in SharePoint document library?